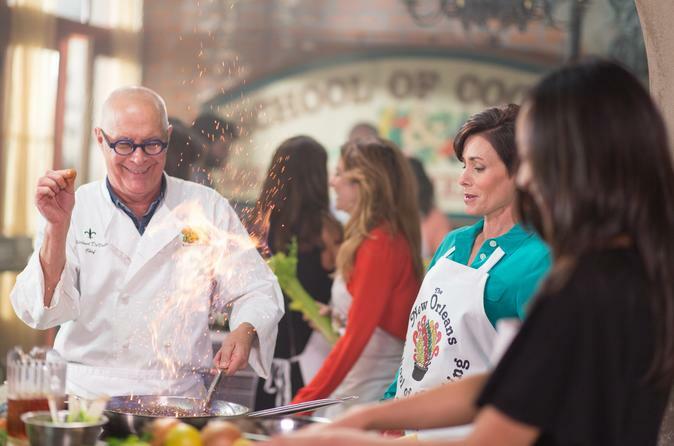 Learn how to cook an authentic Louisiana meal in this 3-Hour New Orleans cooking class. An expert chef will guide you and a group of, at most, 10 people through various recipes. Wine and beer are included in the price, and you can take your recipe and apron home with you after the class. Choose from multiple departure times and meals upon booking. Cook & eat an authentic Louisiana meal! In this highly interactive class, our guests actually cut, season and prepare a complete dinner with one an expert chef, and afterwards they are able to sit down and enjoy the meal they have just created. These small intimate classes have a maximum of 10 people utilizing 5 cooktops. Singles may be paired with another individual. Price includes red and white wine and Abita Amber Beer (a local brew) and you'll even take home your recipes and apron! Dishes you may cook include gumbo, BBQ shrimp and grits, bananas foster, yam-crab bisque, shrimp remoulade, and more delicious favorites.